Hey Everybody! Happy Monday to you all and I'm so excited to have you here today because we've got an amazing Paper Pumpkin Hop! 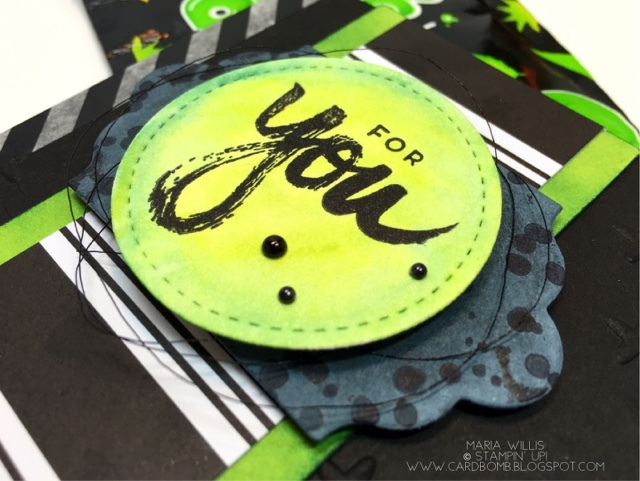 We've got an amazing group of talented stampers who are all going to share alternate cards and projects using the "A Sara Thing" Paper Pumpkin kit. Make sure you check out the whole hop for a chance to win yourself a free kit! Now, on to the good stuff! I had fun coming up with this card and I decided to use the large, embossed watercolor piece. I watercolored it with Lemon Lime Twist and Tranquil Tide and then cut it out. I used the same two colors to give my sentiment piece a pretty background. 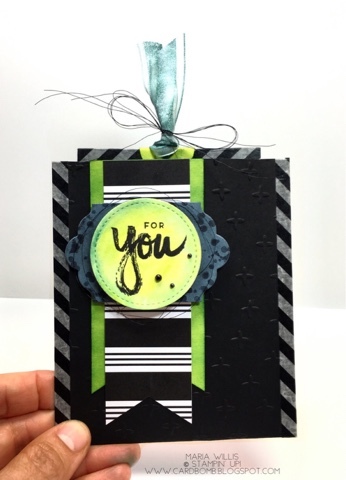 The strip in the background is Lemon Lime Twist sponged with Tranquil Tide and wrapped with Black Metallic Thread. I finished my card off with some white enamel dots and some pearls that I colored black. For my project I made a pouch with a fun treat inside! Pop Rocks! Talk about a blast from the past! I used to think these were so much fun to eat! This past Easter my niece and nephews had Pop Rocks for the first time and it was so fun to watch the looks on their faces as the little rocks sizzled on their tongue. First, the look of surprise and then their eyebrows went up and smiles filled their faces! It was so fun to see! Again, I watercolored the background and embellished with black pearls. 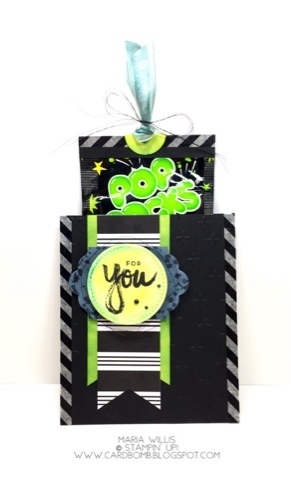 I layered it over black cardstock that I sponged with white craft ink and stamped with the fun, splotchy dots from Sara's PP kit. The ribbon on top is white ribbon that i've dyed with Tranquil Tide to match my project. Oh, The washi tape on the sides is from the PP kit too. 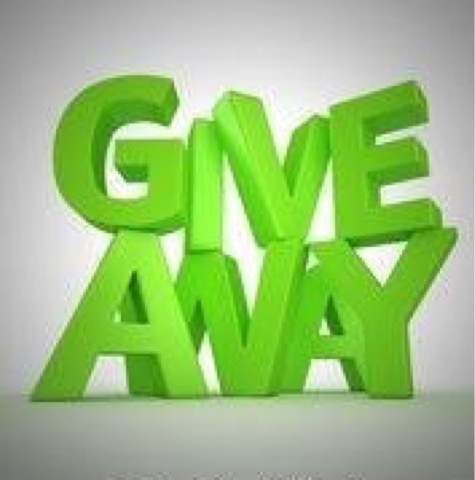 That's all I've got to share with you today but please keep on hopping for a chance to win our give away! Now you are off to see what the talented Jennifer Hill has to share with us today! Enjoy! Definitely inspiring projects! My first one didn't turn out like I had hoped, so I am glad to see your cut out on your first card! I can do that! Thanks for sharing! Yes! Cutting it to pieces is a good fix! Two awesome cards! 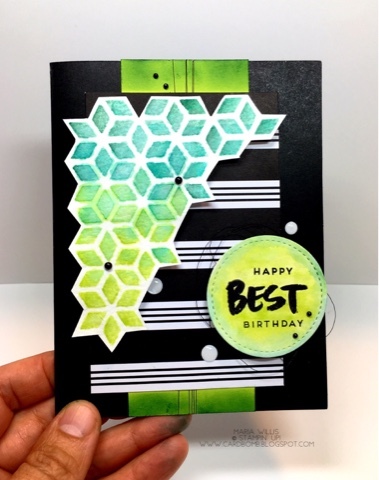 I love the watercolor geometric layer on your first card. Such a fun look! Beautiful projects with this fun kit! I love how you cut out the flowers. 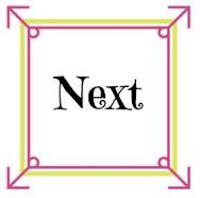 Love that new in color too!!! Cute idea with the Pop Rocks! I think I will use the front of the packet for a card. These bold colors are just delightful! Love it. Isn't it funny that one little box brings so much fun and NO duplicates. Love the pop rocks! Think this would be a cute end of year gift for my son's percussion section! The colors are 'smashing, great cards. Thanks for sharing. So cute! I love the black pearls! Super cute! Glad you got you kit in time. Great idea! I forgot all about Pop Rocks! The pop rock idea would be great for a party! Thanks for the idea!! Oooooo, I love the first card! 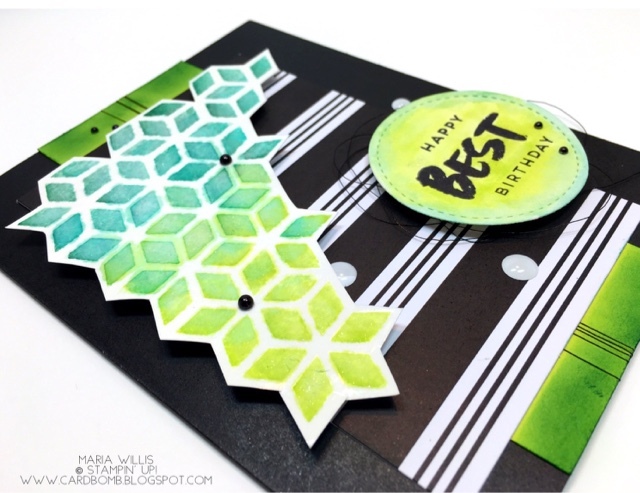 I like how you cut it out at a diagonal & used Lemon Lime Twist & Tranquil Tides together. The black background really makes it pop! What fun cards! And I haven't seen pop rocks in years! I LOVE the pouch with the Pop Rocks! What a great idea! 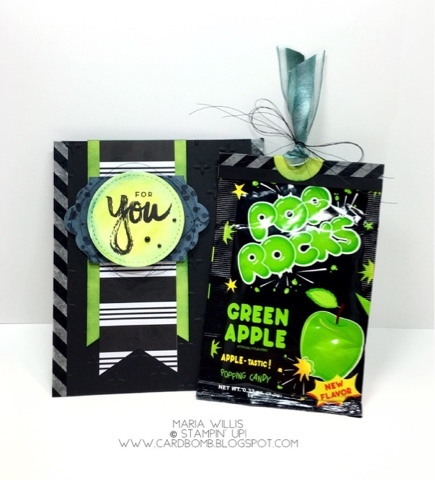 Hi Maria, Your Pop Rocks creation is really, really cute! But tell me, how did you color that ribbon Tranquil Tide? I am new at making cards and I would like to learn. Another thing that would fit that creation is Lik-m-Aid pouches (which I love). Thanks for your ideas. Hi Pamela! Sorry for the delay in response! To color the ribbon Tranquil Tide I started with white organza ribbon. Then I used my Aquapainter and some tranquil tide ink to "paint" the ribbon until it was the color I wanted. Then you let it dry and it's ready to use. It's pretty easy to do and it works well with white ribbon and twine too! Have fun giving it a try!